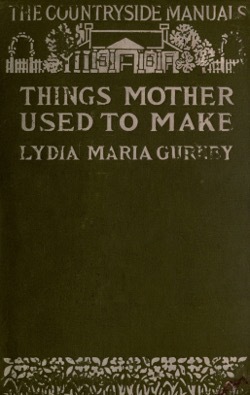 The Things Mother Used To Make consist of old fashioned recipes, which have been for the most part handed down by word of mouth from one generation to another, extending over a period of nearly one hundred years. 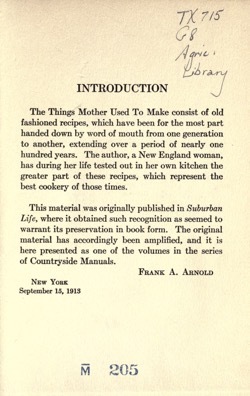 The author, a New England woman, has during her life tested out in her own kitchen the greater part of these recipes, which represent the best cookery of those times. 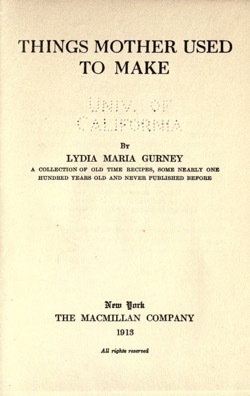 This material was originally published in Suburban Life, where it obtained such recognition as seemed to warrant its preservation in book form. The original material has accordingly been amplified, and it is here presented as one of the volumes in the series of Countryside Manuals. Good food depends as largely upon the judgment of the cook, as upon the materials used. These recipes and Household Hints are written very plainly, for those who have had no experience, no practice and possibly have little judgment. They are very simple, not expensive, and if fol- lowed closely, will ensure success. 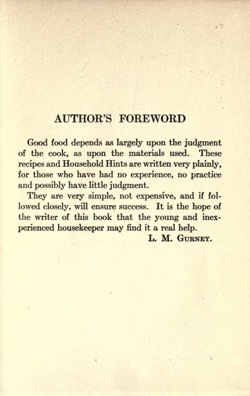 It is the hope of the writer of this book that the young and inex- perienced housekeeper may find it a real help. Beat the egg, and stir flour and milk in slowly, a little flour, then a little milk. Salt a little. This will make a very thin batter. Drop into well- buttered muffin pan, bake in a very hot oven and serve with hot sauce for a pudding, or eat with butter.